Mrs. Gantt explains that she sent a check for $37.50 to care for a little girl that Martha Berry mentioned in a letter. She is asking whether or not it was received. 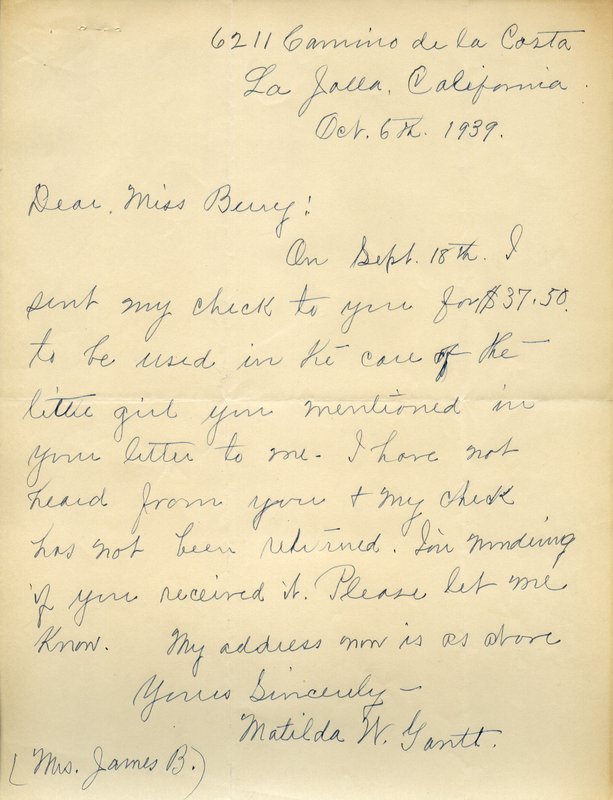 Mrs. Matilda W. Gantt, “Letter to Martha Berry from Matilda W. Gantt.” Martha Berry Digital Archive. Eds. Schlitz, Stephanie A., Jordan Brannen, Cassie LaJeunesse, Jessica Hornbuckle, et al. Mount Berry: Berry College, 2016. accessed April 21, 2019, https://mbda.berry.edu/items/show/14905.